Christmas started out with a ton of snow. 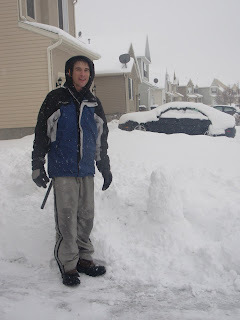 Barry shoveled our 8" of snow out of the driveway and even built himself a snowman that looked a little like darth vader. It's hard to tell that here but really it did. We had a fabulous Christmas morning. 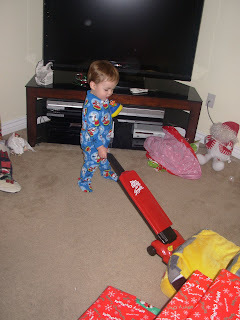 Of all the toys Andrew recieved, the toy vaccum was and still is his favorite. Who would have known. Barry got me the toy of my dreams, a new IPod Touch. My mini has been on the fritz lately and dies everyday which makes teaching my dance classes pretty hard. All is good now. He also got me some beautiful art work that I need to figure out where to hang. He got a digital media player that will take all of his saved movies on the computer and play them on the TV. No more burning disks for Barry. The rest of the day was spent at the Wachter household where all 28 of us gathered together for the annual dinner and present exchange. As usual the massive paper fight broke out and even Andrew got involved. I saved the best picture for last! Cathy, my sis took the best picture of Andrew. It's one that will be shown to girlfriends and others for the rest of his life!!! I hope you all had a fabulous Christmas and will have a safe and wonderful New Year!!! It looks like you guys had a great Christmas! 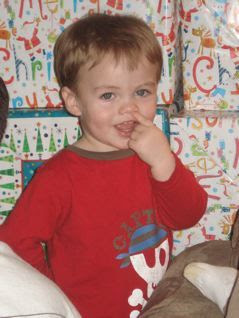 Oh my goodness....that Andrew looks so much like a Wachter, and not just in the picture with his finger in his nose. HA! Just kidding. He is so dang cute though!! Happy New Year to you all! Looks like a fun Christmas for sure!! 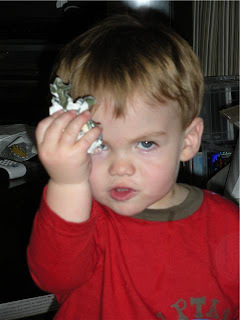 I absolutely LOVE that pic of Andrew in the paper fight...too cute!!! Andrew is getting so big! Wow! I'm glad Barry told me about your blog.